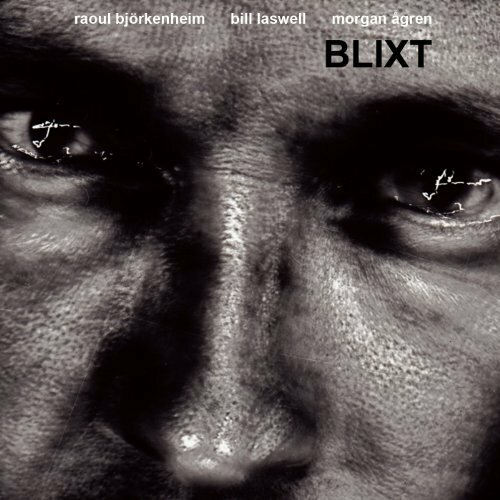 As it says on the cover, Blixt is Raoul Björkenheim, Bill Laswell, and Morgan Ågren. And in case you weren't aware of it, they are all monsters on their instruments. But technique alone does not make successful music, and the history of music is filled with terrible albums by good musicians. This one starts of with "Black Whole," and it quickly becomes apparent that these guys are taking the "monster" metaphor a little more literally than they had to. They are fierce, aggressive, and frightful, three apocalyptic horsemen sweeping through the village leaving destruction in their wake. But it's not pure bluster — there's real depth and subtlety to these tunes. And in between the fiery moments, there are periods of calm — they know how to use space. I'm reminded of the first incarnation of Tony Williams' Lifetime, as on Emergency! only without any keyboards — this has a similar edge to it. Björkenheim has quite an arsenal of effects, everything from distortion to wacky ring modulation, and Laswell has his own rack of sound manglers — I almost feel sorry for poor Ågren with just a drum kit, but he does enough with it that the music never lacks for inventiveness. For every passage in a tricky odd meter, there is a floating moment of atmosphere where such things as beats are only rumors, not to be completely believed. This is an outstanding entry into the crowded ranks of power trios, one that's sure to make frequent appearances in my player.